← From Drop-outs to Stand-outs. 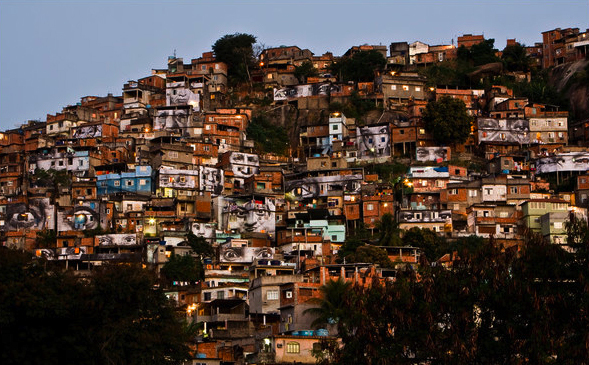 Think you see a slum? Look again. In October, the TED (Technology, Design, Entertainment) Conference — darling of bright, young hopey-changey folks –like me! (minus the young) announced that its $100,000 annual award was going, not to high-profile activists like past winners President Clinton and Bono, but to an obscure French photographer known only by his initials, J R.
What J R has created, in some of the worst slums in the world, are huge, riveting photographic portraits of the residents living there. The photos are printed on waterproof vinyl that also act as new roofs – and to say they are arresting is an understatement. He could also be arrested since his projects are usually unauthorized and put up surreptitiously with the help of volunteers. 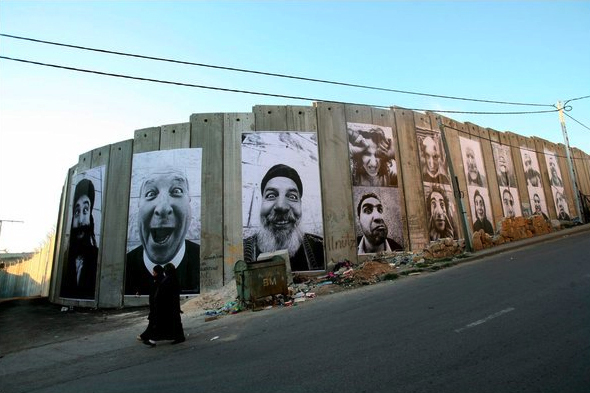 The Palestinian side of an Israeli security wall in Bethlehem. 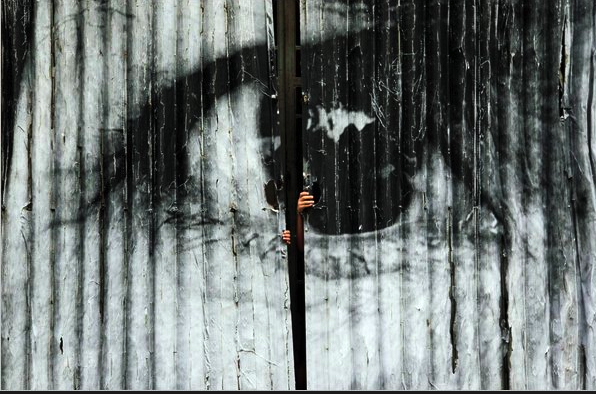 He calls himself a “photograffeur” (graffeur meaning graffiti in French) and that fits his subversive, insistent portraits that dare you to look away from the eyes, wrinkles, lips and smiles of the people we try not to see. I love these photos so much, I had to share them – even though I have no permission, since nobody knows how to get in touch with J R. But I’m hoping he’d approve, since my only wish is to share his gorgeous, whimsical, haunting work – and contribute to his next project of old people in Shanghai, being displaced as the city razes a historical district for development. 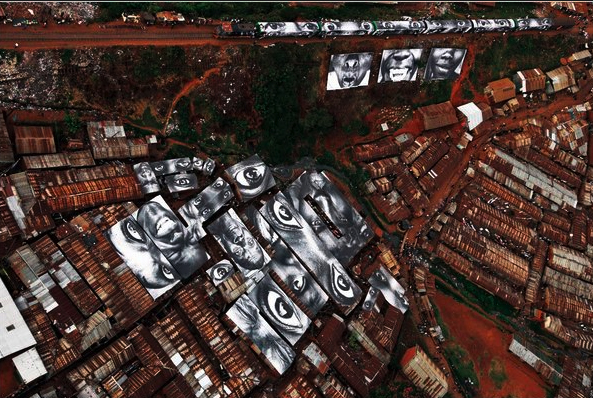 When I look at this work, I imagine the people in Kibera, the favelas of Rio, and slums of Phnom Penh walking to work every day in the shadow of these portraits and feeling dignified, respected, seen. And I envision children playing under the eyes of the murals and feeling validated, important, precious. Kibera slum in Nairobi, Kenya. I love J R’s work and hope somebody can tell me how to reach him, so I can give him my “starving artist” grant of $100 to keep going. Keep seeing. Keep snapping. When Oprah talks, the world jumps! 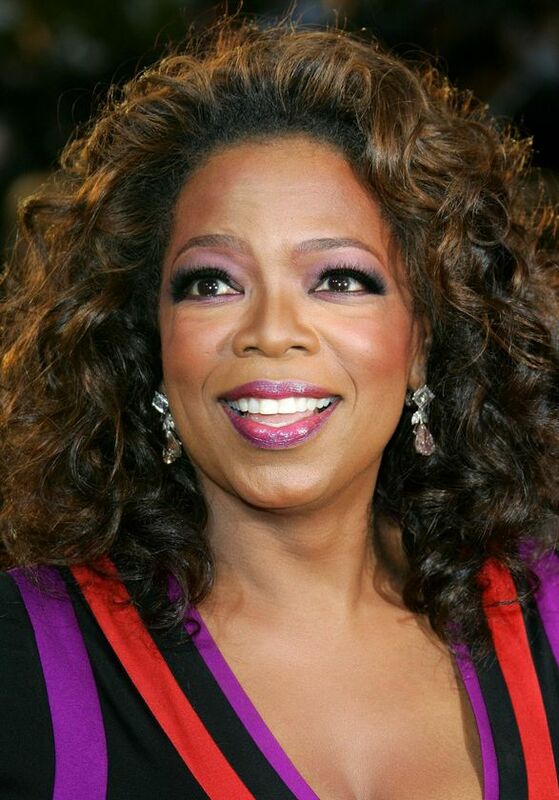 Queen/Goddess/Uber-Giver Oprah just named Donors Choose (see post on February 9) as one of her Ultimate Favorite Things of 2010 – and gave everybody in the audience a Gift Card to make the wishes of teachers in low income schools come true! So if I can’t find J R, this is where my $100 is going! WOW…this is one of the most inspiring things I have ever seen! What an amazing, creative and loving thing to do for the people that live there. They would have to feel very special to be represented like this….I know I would love to be honored this way! Thanks for showing JR’s work! I hope you find him Betty. Your blog is always an adventure, and I can’t wait to see what you’re going to do next. Good luck finding J R.
I second this question/request! Pretty please?! These images are incredible. I had not heard of this before. Thanks again for spreading the joy. 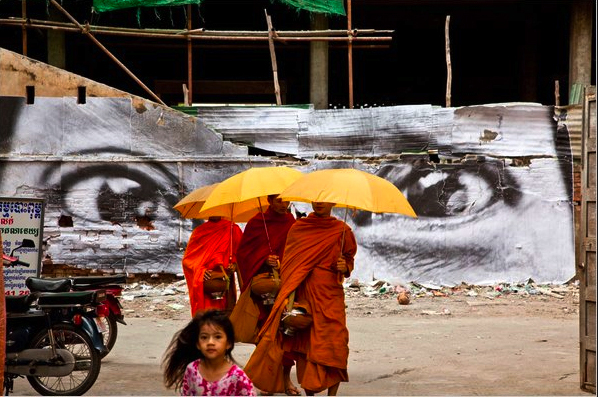 thanks for this post on the photographer, JR, whose work I have admired from afar. JR’s acts of recording for humanity, done by a humane “chronicler,” can restore respect and add new faces in the consciousness of “others.” it is easier to dismiss those in poverty when they remain faceless and when they are otherwise deemed less than worthy of acknowledgement. 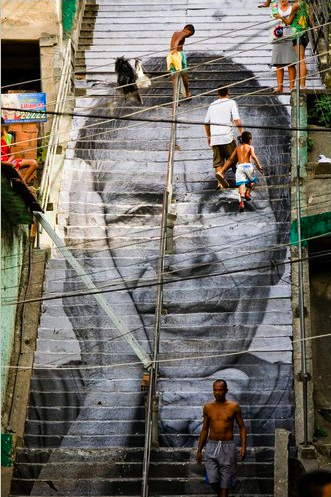 JR’s photos show the true worth of many whose lives and talents in spite of adversity oftentimes are ignored.